A tribute to precious oriental perfumes. Balms, resins, vanilla and powdery effects create intensely sensual and addictive blends. A startling and unusual base of carrot, seed and wood adds an unexpected twist. An original edginess in an oriental perfume that loses none of its sumptuous opulence. In fact, quite the opposite… An extraordinary blend, green and creamy. Oriental Express was my immediate favorite of the Les Exceptions collection from Thierry Mugler (see Tuesday's review of Supra Floral), and after spending more time with all them, it's still top of my list. The description above is reasonably accurate: it's a unisex woody iris-y carrot (or a woody carrot-y iris, take your pick), somewhere in between Honoré des Prés I Love Les Carottes and Van Cleef & Arpels Bois d'Iris. It starts, as advertised, with a green herbal cast over some bright citrus. I would not have guessed basil, but it's obvious if you go looking for it early on, and it makes for an interesting mix with the iris and carrot notes, which are likewise present from the outset. It's not as overtly carrot-y as I Love Les Carottes (or as the opening of Hermès Hiris), and it's warmer and drier, with mild hints of spice. As it dries down, it's woodier, and slightly sweeter, although it never gets as sweet and vanillic as the Van Cleef & Arpels (or the original Dior Homme, also by Polge). I would call it middling-powdery, and middling-dark, and it has a kind of sober elegance — it's not a loud, heavy oriental in the traditional sense, and it's certainly more discreet than you might expect from Mugler's prestige line (A*Men, Angel, Alien, etc and etc). Verdict: Beautifully done, and if you don't already own a perfect powdery woody iris, very much worth a try. I really like Oriental Express; if I could have one free bottle from the collection, this would be my pick, and I do think I'd reach for it often. 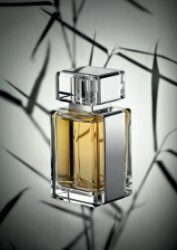 My main quibble with the description is with the "original edginess" — I have so many similar perfumes in my collection that I'm no more than slightly tempted to buy, and of course, the price is an additional (and effective) deterrent. Thierry Mugler Oriental Express is available in 80 ml Eau de Parfum in a refillable bottle, $225. It is already out in Canada at selected Hudson's Bay stores, and it will be introduced in the US in late September, at three Nordstrom stores (Miami Aventura, LA South Coast Plaza and Chicago Michigan Avenue). It was developed by perfumer Olivier Polge, possibly with perfumer Jean-Christophe Hérault (it is not clear from the press materials whether they worked together on all five scents). 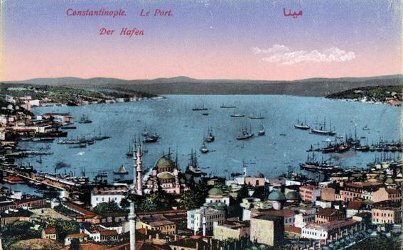 Note: top image is Postcard of Constantinople: the Harbor via Harry S. Truman Library and Museum. This sounds elegant though very foody – I tried Les Carottes a while ago, and it was too uncomfortably close to home made carrot soup – but I may still try it if I get a chance. This is less foody than Carottes, I think, and for a shorter time. Carottes is basically iris-y carrot from beginning to end, this is only carroty in the early stages, then it’s a more “sober” iris. This sounds interesting, but it costs too darn much. I really liked I Love Les Carottes, but it was VERY light on me — too light. I’m definitely a rooty iris fiend. This is not as light (or cheerful) as Les Carottes, but it’s not what I’d call heavy either. Hoping the price is a mistake, but I doubt it will be cheap in any case. Wow. Something other than an Angel flanker. Bravo. I am wearing this right now, and I do not get any carrot. It is a powdery, woody iris with a gourmandy sweet touch… Reminds me of Iris Ganache in feel. Good stuff – and the bottles are refillable just like Angel and Alien, for about $60 less than the full bottle price. Oh, and it is only $185 Cdn for the bottle here, &127 for the refill. We never get anything cheaper than the US! Yes…got the $225 price from TM’s press people, but no idea if it will turn out to be correct! I really like this one too, although the iris is just a little too powdery for me.